Mobile Field Service System Powerful field service software accesses vital Alarm SQL customer data wirelessly. Now with Signature Capture and GPS Logging. TechWeb is an essential tool for any business involved with field service. Designed for field technicians or anyone requiring live access to customer data wirelessly, TechWeb provides the freedom of mobile access to your Alarm SQL data via any touchscreen tablet device with a web browser. 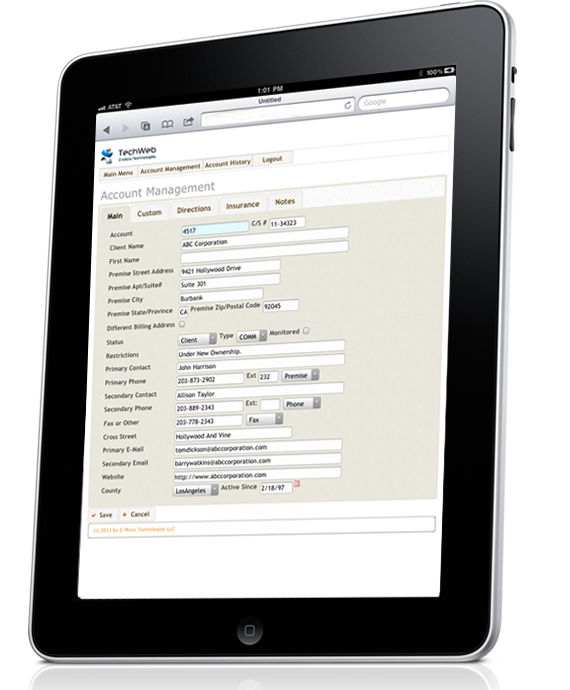 Whether used on the impressive iPad or other touchscreen tablets, TechWeb is designed for fast access to customer history, installed equipment, zone list, emergency contact lists, alarm signal history, service history, inventory, rolodex, support records, and more. Even laptop/netbooks, PC and Mac computers can be used if they have internet connection - perfect for the home office or work-at-home staff members. With built-in security levels to control access by each user, TechWeb is a vital resource for anyone in your business that needs wireless access to customer data anytime, anywhere. TechWeb was designed from the ground up to be compatible with a wide variety of mobile devices rather than be restricted to use on just one type of device. With 'style sheets' included for the most popular screen formats (additional screen format style sheets provided if needed at no additional charge), TechWeb is extremely flexible to meet the specific needs of your mobile workforce. - Invoice History (view only) including Invoice Details and Payments. Email invoice capable. Above sections have access rights based upon security level per user. Each section may be granted/denied access. TechWeb is available with flexible pricing plans to fit the budget of every security dealer. License includes usage for an unlimited number of users in your company. Requires Alarm SQL and sufficient SQL seat availability (typically 1 SQL seat is enough for most environments but may require additional seats during high usage times with many multiple technicians). Screens and features subject to change prior to release. Video 2 - Customer Emergency Contacts, Zones, etc. One touch access to customer data from any touchscreen mobile device. Fast over wi-fi or 3G! Supports iPad, Android Tablets, Mobile 7 Phones, Laptop and Netbooks, PC and Mac platforms plus any device with standard web browser capabilities and built-in cellular or wi-fi. View Only or Add/Modify/View access permission on most areas - based upon user security levels. Technicians have access to daily service and installation orders with ability to enter work performed, timecards for hours worked and more. Customizable 'style sheets' allows modification of font style, colors, backgrounds, navigation icons and more.